The bad news is that Betsy DeVos and her corporate pals are spending incredible amounts of money to convince parents that public schools are “failing”. The good news is that it’s not working. A new poll out this week shows that, despite efforts by corporatists like Sec. 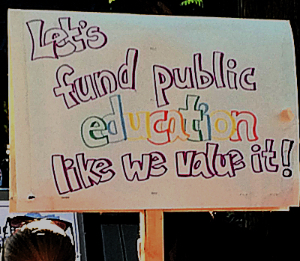 of Education Betsy DeVos and others to push for-profit charter schools under the guise of “choice”, what parents REALLY want in America is better support of public education. The poll was conducted by Hart Research Associates for the American Federation of Teachers (AFT). It surveyed 1,200 public school parents – including oversampling of African American, Hispanic, and major city parents – and was conducted July 24th through August 3rd of this year. 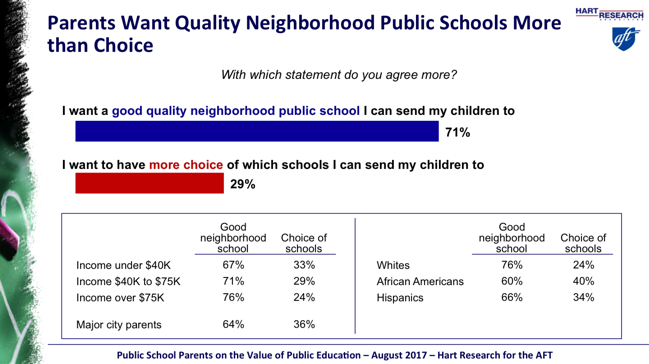 Of all the findings, this was the one that stuck out at me most: Parents want quality neighborhood schools over charter schools by a more than two to one ratio. 79% of respondents were satisfied with their public schools. In major cities, the number was even higher at 82%. 73% of parents rate their local public schools as “good” or “excellent”. 73% of parents believe the key to better teaching is treating teachers like any other professionals, raising hiring standards, and giving new and struggling teachers more support and training rather than firing them. 86% of parents in the survey believe education dollars should be used to improve the quality of education in neighborhood public schools rather than to help parents pay the cost of sending their children to private or religious schools, at taxpayer expense. 61% of parents believe too much emphasis is put on testing of students. Three quarters of parents have heard of Betsy DeVos and disapprove of her performance by a nearly two-to-one margin. 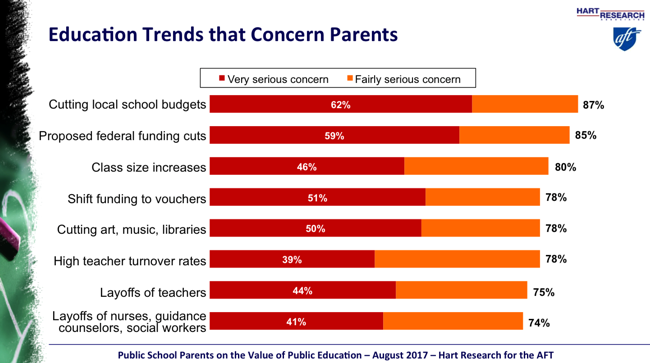 Only 20% of parents believe that an important aspect of improving education is opening more charter schools and voucher programs and reject shifting money from public schools to charter schools by a more than two-to-one margin. These results fly directly in the face of the propaganda put out by so-called “school reform” proponents who want the world to believe that “inner city” parents are leaving public schools in droves in favor of for-profit charter schools because they believe their public schools are failing them. The truth is that these parents are seeing fewer and fewer choices as Republican education policy tilts the playing field in favor of charter schools, siphoning off precious education funding into the bank accounts of the corporations who run charter schools. These parents don’t see a widespread problem of “poorly performing” teachers. What they see are teachers in need of support and training, professionals who deserve to be treated like any other professional in that way. In the battle to save and improve our public schools, we are in a war of ideas. Those on the right fill the air with lies and distortions regarding public education, frequently trying to pit people in urban areas against their more affluent neighbors in the surrounding suburbs. Except, instead of making the wealthy surbanites fear those in the cities, they are using the opposite tactic: they want poor people living in big cities to believe that they are being denied “choice” by the current system and the answer to that is more charter schools that enrich the investors and corporations that operate the schools. If they can convince these parents to abandon public schools, their work is essentially done. The good news that this poll reveals is that parents are not buying these lies and deceptions, the propaganda being spewed by DeVos and her corporate pals. The poll shows that parents KNOW how important local neighborhood public schools are and they KNOW how important investing in them and in the teachers who educate their children is to their kids’ ultimate success. The key now is to make sure the rest of the country hears this message. This must become “accepted wisdom” and displace the propaganda that corporation are spending incredible amounts of money to spread.